Tim Wilson (GoDan - 5th Degree) Sensei Tim Wilson began his karate training in 1984. His current rank is GoDan, 5th Degree Black Belt. He has competed for many years placing and / or winning top honors at the Miami Valley Tournament Association. 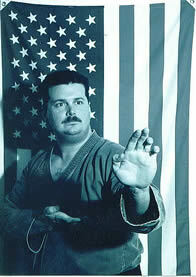 In 1994 Sensei Wilson placed at the United States Karate Federation Ohio State qualifier. Went on and won a Bronze medal qualifying him for the USA National Championships. Sensei Wilson teaches both the Kid and Adult Classes. In 2012, Sensei Wilson was inducted into the Miami Valley Tournament Association Legion of Honor. This award is presented to individuals who have distinguished themselves as leaders in the Martial Arts Community.